Was making the final turn with the left signal to work when a Mercedes-Benz E350 hit me doing at least 50MPH. Sheared off the front wheel (took out a sign before coming to rest in the bushes) and turned me completely around. All the air bags went off, had to use the emergency latch to get out. Other than some stiffness and bruises on my hands, I’m OK. Two eye witnesses gave their statements to the police, corroborating the fact that she ran the red light. 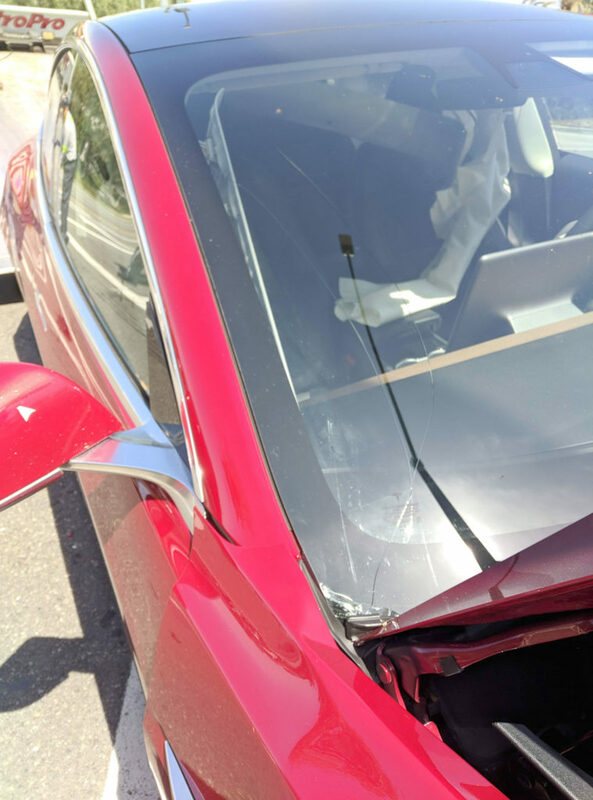 We caught up to Ray and got some exclusive photos of the car after the accident happened to check the vehicle damage from different angles (exclusive photos below). 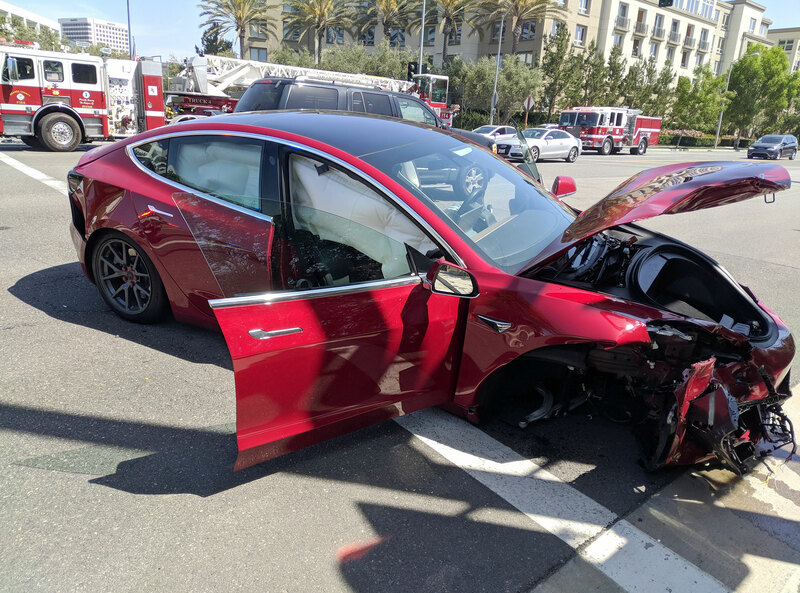 In recent months, Tesla has been criticized for not providing great customer support but in this latest incident Tesla called the Model 3 owner within 5 mins of the incident and asking him if he needs any assistance at this time, let’s read this in the words of the owner. 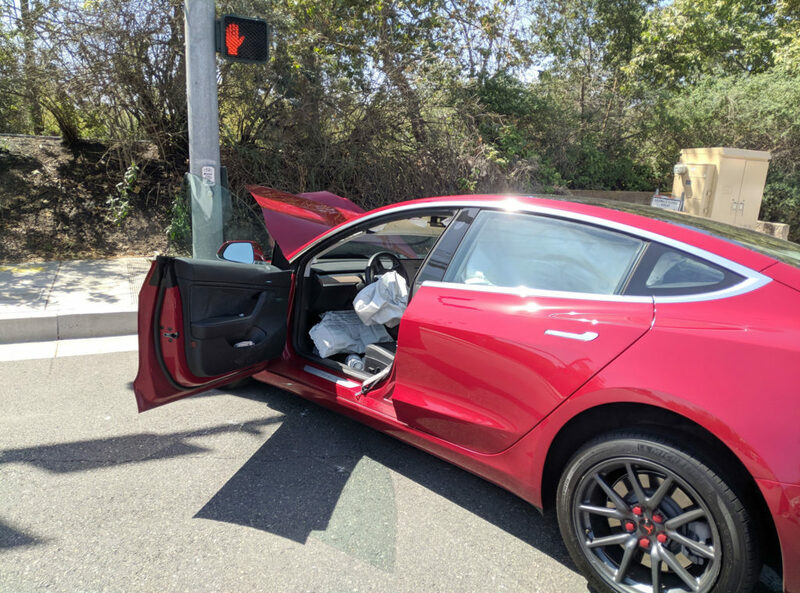 Tesla called me about five minutes after: “Hi, we think your car might have been in an accident”. Yes, yes I was. “Will you be needing assistance?” Oh hells yes. This kind of service is exclusive to Tesla since the cars are connected to the company’s HQ, Tesla is the only automaker on the face of the planet that knows the current state of their entire fleet, this is just plain amazing, straight from the future happening today. Besides the Model 3 driver receiving minimum injuries in the incident (Tesla Model 3 has the lowest probability of injury of any car ever tested by NHTSA), the car did not rollover even after taking a ~360° spin, the low center of gravity of the Tesla and electric vehicles makes it almost impossible to rollover the car. In an NHTSA test video (below) from last year, we saw that it was virtually unattainable for the testing authority to rollover a Tesla Model X despite it being an SUV, SUVs generally have a bad reputation when it comes to rollover in an incident, Model 3 is a sedan, so we can imagine this part of the safety is far beyond any internal combustion engine car ever made. Also, the empty front trunk (frunk) area provides a large blank space as a ‘crumple zone’, absorbing most of the impact within this territory. I wrote an in-depth article on ‘How Tesla produces the safest cars on the planet‘ for EVAnnex blog, you can read it if you’re further interested in this topic. 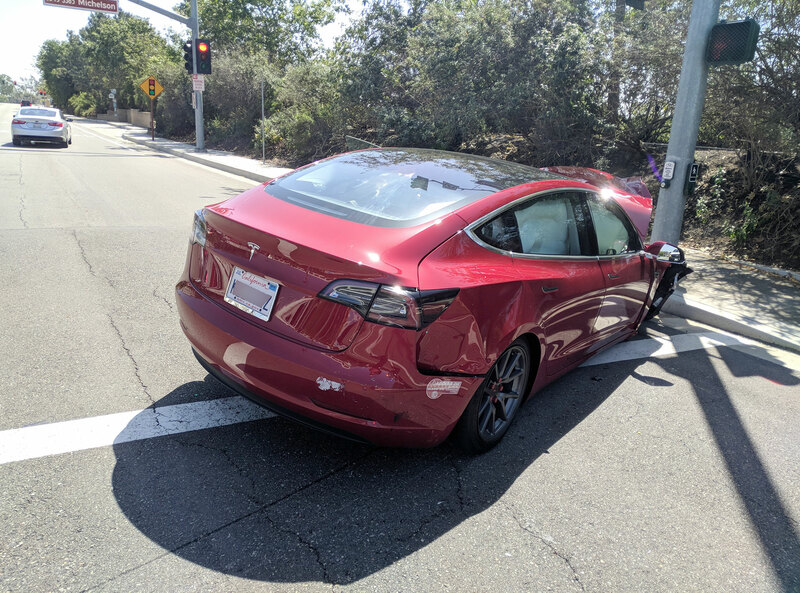 Tesla Autopilot software’s basic safety features are always active, does not matter if you bought the Autopilot or Full Self-Driving package or not, we have previously seen a Tesla Model 3 avoiding a frontal crash using the front radar and AEB and the footage was recorded on the dashcam. 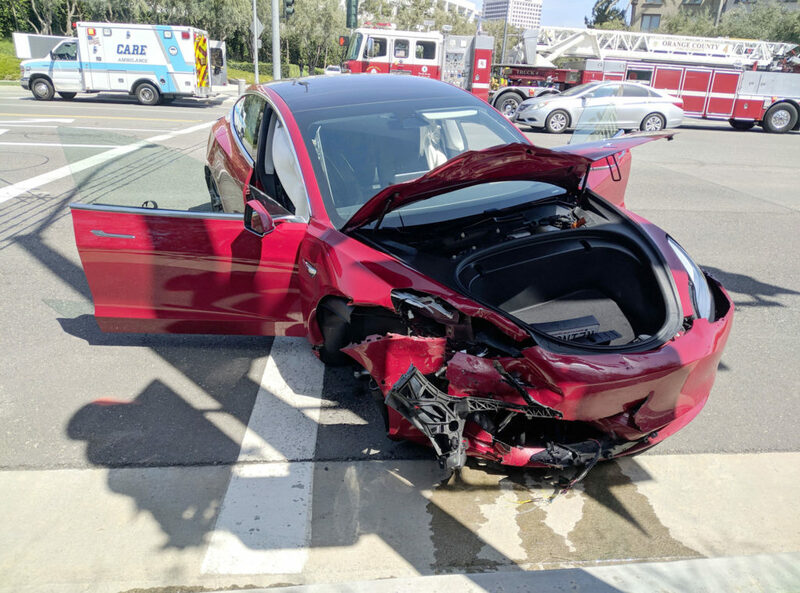 What this means is that a customer who did not buy Autopilot or FSD software package still enjoys the safety of the Autopilot hardware which is 8 cameras, 12 ultrasonic sensors, and a front radar, safety of yourself, friends and family is priceless and Elon Musk has expressed it several times that Tesla’s top priority is ‘safety’ when designing/building a vehicle. 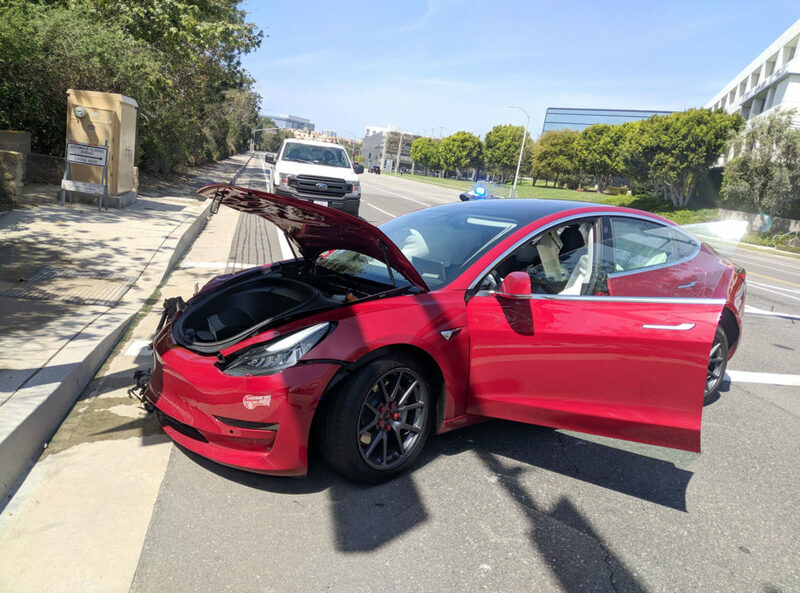 Image Credits and Copyrights: The Model 3 crash photos are provided by the owner ‘Ray Clouse‘ on our request and gave us his express written permission for the use. © All image rights belong to him. You can reach him on his Reddit handle ‘u/rclouse’.